Jeff For Banks: Banking Strategies: Should We Look to Utah? Banking Strategies: Should We Look to Utah? If you could build a bank that delivered a 2.49% ROA, twenty three percent deposit growth that is 100% core, and zero non-performing loans, would you do it? That is exactly what Salt Lake City's Optum Bank delivered. Over four years ago I penned an American Banker article encouraging financial institutions to specialize to develop a competitive advantage over large financial institutions that dominate our industry. Two years ago I wrote a blog post that plain vanilla banking, now considered conventional wisdom, may lead us to irrelevance. In December, I ranked the top five financial institutions by five-year shareholder total return. On top of the list was a niche bank, BofI Holdings, Inc.
Just this month I taught Bank Profitability at the Utah Bankers' Association Executive Development Program. Utah, home of the Industrial Bank, is the epicenter of niche banking... i.e. banks chartered to focus on a narrow strategy. Now, how many of you are rationalizing the performance of Optum Bank from the first paragraph, thinking, "oh, it's only an Industrial Bank"? Optum Bank is owned by UnitedHealth Group, a health insurer, to specialize in Health Savings Accounts. It opened for business in 2003 and hasn't been below a 2% ROA since 2005. If you could deliver such performance, would you? One of my students at the UBA's EDP was from EnerBank USA. Here is another Industrial Bank that has a specific niche, lending to homeowners for home improvements through construction contractors or home improvement supply dealers. 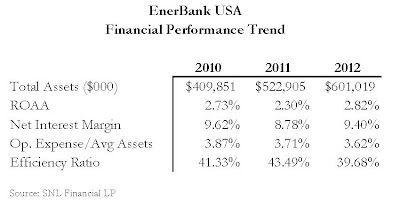 EnerBank is owned by a utility company. Many community bankers would roll their eyes at such banks. 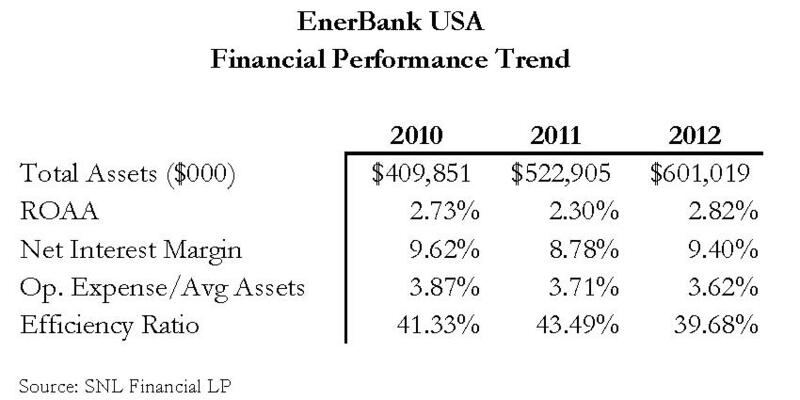 But look at EnerBank's performance! Would you like those numbers? I'm not suggesting closing down the mortgage department and boarding up the branches. Prudent risk management suggests we should have diversification in our loan portfolio and funding sources. But this fear of specialization confounds me. Why can't we be known for banking dentists and veterinarians, like Live Oak Bank in North Carolina, or serving Philly's Main Line affluent, like Bryn Mawr Trust? And yes, why can't we learn from the 31 active Industrial Banks from Utah? I think there is something to be learned. What do you think? As Willie Sutton once said, "Go where the money is..." Makes sense! Uncle Sam: Get out of my house! The Tax Man Cometh: Do You Pay "Your Fair Share"?